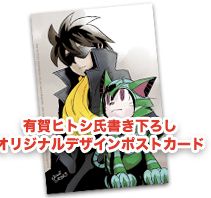 As you can see, postcard artwork varies depending on the retailer you're buying the book from. What's more, Tanomi updated their listing with rules about a special sweepstakes. 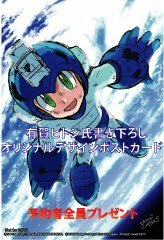 Apparently, if you collect five tickets found inside of Rockman Megamix volume 1 and volume 2 and mail them attached to the backside of the the Gigamix 3 postcard, you could be eligible to win an original cel drawn by none other than Hitoshi Ariga. You can find all the details (in Japanese) at Tanomi's Gigamix 3 page. Hoping to get a more thorough translation soon!